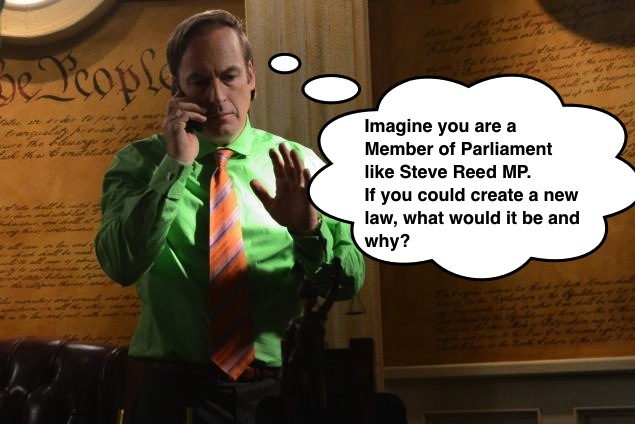 Thought for the week: If you could create a new law, what would it be and why? Previous Post Well done Mr McCormack!
. If I was made to be a mp i would make everyone rich. And give people good dicapline with money. Don’t they think that we pay enough bills. All kids that ride bikes to school should were a helmet ! 1:Every one in school gets homework 3 days a week. 2:People in school can wear there own clothes 4 days a week. 3:Every week people donate £50 to people who live in care and also old people’s home. I would make a new law that the homeless people should be sheltered and cared for (similar to a care home but they would have to work for their place) and they shouldn’t be treated with less respect than the more wealthier people. Do not drive without the car lights off if the weather is bad. I would make a law about building works to be banned. Although it could help buildings from getting rotten, Otis still a destruction to certain neighbourhoods and could prevent people from getting sleep, which could stop them from being at their best ability in the morning. There are some great ideas here. Keep it up. Personally, I would like to have better food labelling laws. Things like a speech bubble saying “WARNING: I have 8 spoons of sugar in me!” on the side of a can of Coke would, I think, help people make better choices. 2 – Sωєαяιηg ιη ƒяσηт σƒ ρєσρℓє (тнιѕ ιѕ gσιηg cяαzу).